For a Rs 6,999 smartphone, Yuphoria has a decent built. The front is dominated with a 5-inch touch display with 720x1280p display. I was extremely impressed with YU's first smartphone, Yureka. Micromax's online only sub-brand, YU, has now come up with a budget smartphone under Rs 7,000. But can it live up to the hype created by Yureka and is worth the money? Let's find out. Name Game: The brand YU is trying to connect hard with its customers and have crowd sourced the name Yuphoria for its second offering priced at Rs 6,999. Design and Built: For a Rs 6,999 smartphone, Yuphoria has a decent built. The front is dominated with a 5inch touch display with 720x1280p display. YU has added Corning Gorilla Glass 3 protection to Yuphoria, which is rare in this price segment. The display appears to be crisp and the sunlight legibility is good. The metal frame running around the sides, including curved corners, is done in champagne gold. The white plastic rear is removable giving access to dual SIM slots, memory card slot and the battery. There is a huge camera lens popping out on the top (as seen in a few Lumia smartphones) along with the YU branding and speaker grill at the bottom of the back. Operating System and Performance: The highlight of the YU smartphones is the Cyanogen OS , which is known for the customisation it allows to the user. OnePlus One and Yureka too had Cyanogen OS. The Yuphoria has Cyanogen OS 12, which has been built on the aftermarket version of Android Lollipop operating system. 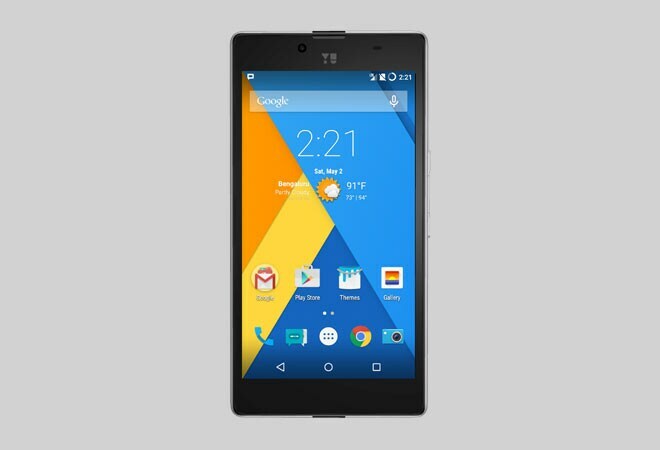 The overall look and feel of the Yuphoria is very similar to the stock Android operating system. One can choose the theme, fonts, style, etc. to customise the user interface (UI) of the smartphone. All this works well on Yuphoria. There is also a Baton App (in Beta) for syncing apps and game data. The phone also has got the regulars along with Google Apps. Using Cyanogen operating system, one can also access Privacy Guard under settings, which allows user to control permission settings. The device is powered by 1.2Ghz Snapdragon Qualcomm 410 quad-core chip with 2GB of RAM. It comes with 16GB of internal storage and supports up to 128GB expandable memory. There wasn't any lag while using this smartphone for work or gaming but it did heat up after a few minutes of use. Camera: With 8MP camera becoming a standard for smartphones, even YU Yuphoria packs one. The UI of the camera app is neat and just by swiping you can switch between the modes. However, the images captured are just about average. It does not feel that the images have been captured from an 8MP camera. Low light shots too are just about average with visible noise. There is a 5MP front facing camera for capturing selfies. Battery: The 2230 mAh battery on the Yuphoria manages to last a day with couple of hours of calling, web browsing, imaging and continuous access to email account and social networking sites. Bag it or Junk it: Scores marks on paper but not a great performer. Makes more sense to add a few thousand rupees and consider buying Yureka.